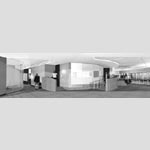 Project Responsibilities: A new look for a LexisNexis auditorium and conference center addresses several design objectives: bringing in more light, integrating glass, upgrading to a more modern aesthetic and modifying the floor plan to improve circulation. The solutions include installing a glass wall open to the auditorium, replacing a corridor wall with full glass, installing glass side lights around office doors, replacing glass walls with flowing curvatures, installing contemporary ceilings and bright lighting, and proposing crisp, contemporary textural finishes. 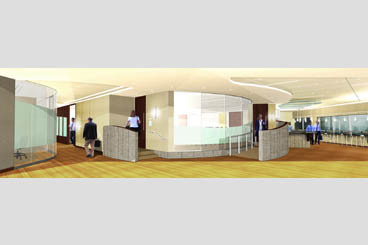 Proposed design changes for the conference room include replacing drywall with frameless glass wall and doors; applying a privacy film to the glass wall to avoid distraction while maximizing light penetration; choosing minimalistic, contemporary stainless steel door hardware, extending new flooring material from the corridor into adjacent conference rooms to offer the visual effect of widening both areas. Plans also call for a cafe with contemporary furnishings and flooring, a custom concrete service counter and curved concrete wall with under-counter lighting to continue to bring in more light. Restrooms would also be upgraded with contemporary finishes and furnishings.